Maybe 1973, the year that the ancient-two-camera-technique video was done, to promote the same album release? It's interesting that David Johansen has stayed part of the scene as long as he has. I'm thinking that this show took place in either '71 or '72, because I can remember when Dave Neff and I were delivering the WTAC music guides to record stores in the area that Recordland (in the Eastland Mall) was preparing for a personal appearance by The Dolls on the evening that we dropped off the music guides in the store. And, at that personal appearance, no one showed up, but many stood in the mall outside the store and snickered ... so, the Dolls began grabbing random albums from the racks, playing frisbee with some and breaking others. It was quite a sight. I google'd the tour dates for the Dolls and came up with a list of Kiss tour dates and the year -- hard to believe -- was 1974. It's hard to believe that I had graduated high school two years earlier. Yep, it was 1974. I was at the show. We went to see the Dolls but Kiss -- who no one had ever heard of at the time -- blew 'em off the stage. The Dolls did an in-store appearance at Recordland in the Eastland Mall the day before. Got to meet Johnny Thunders -- very nice guy. Johansen & Arthur Cane were chugging vodka straight from the bottle. Ah, the good ol' days. 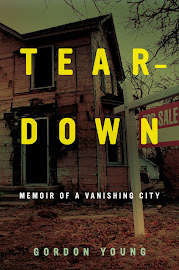 I was just writing about that for the book I'm co-writing on the history of the Flint scene. The IMA show was poorly attended but Kiss caught Peter C's eye and he booked Kiss a minute before they became famous for a Saginaw appearance later that year for next to nothing. By the time of the show, they were huge and the place had naturally sold out (@8000). Aaron, I'm looking forward to the book. According to the list of Kiss tour dates that I found online – the Kiss concert that Peter C booked in Saginaw didn’t take place until the next year (August 16, 1975); and like a lot of the concerts that Peter C produced in the 70s and early 80s – I was lucky enough to be a member of the production team. The Kiss concert at the Saginaw Civic Center was memorable to me for a couple of reasons and one of those reasons kind of prepared me for what would become one of Gene Simmons’ other career choices—acting. Back in ’75, I got to experience something that not a lot of people got to see back then and that is what the members of Kiss looked like without their stage make-up. Once all of their equipment was set up on stage at the Civic Center – Gene Simmons, Paul Stanley and the rest of the band did a sound-check without their make-up on – which was kind of interesting to see. In between the audio sound checks – Simmons and Stanley talked about something that surprised the hell out of me – movies! They would try top each other with Hollywood trivia – from what actor starred in what movie to quizzing each other about who said what in what movie. This was definitely not something that most people would imagine when they think about what goes on behind the scenes at a rock n’ roll concert – but that’s they way they were at this concert. So, after seeing what happens backstage at a Kiss concert at the Saginaw Civic Center – it didn’t surprise me in later years to see Gene Simmons portray some really mean and nasty characters in the movies – and going from talking about movies to being in them. Rich, you should connect with Aaron on his music history of Flint. Great story. 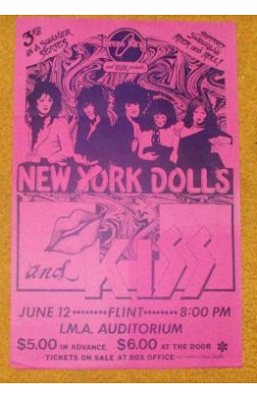 Rich Frost: I was at the Kiss show in Saginaw - my first ever concert. The date was actually August 15, 1975. I saved all my concert stubs after that show - but didn't save the stub from that Kiss show. I have been searching for someone who kept their stub - but have never been able to find anyone. I'd love to either buy that stub or get a hi-res scan of one. The Kiss/NY Dolls concert at the IMA had to be in 1975. I got my drivers license on 06/11/1974 and I know my folks didn't let me use their '74 Monte Carlo to go to a concert the next night. Don't have the ticket stub but have many, many, since that show.